Root canals are one of the most feared procedures for patients who need to visit the dentist, but root canal therapy nowadays is nothing to fear – and without any doubt it will be easier and less painful than the toothaches an ignored tooth issue can cause. If your toothache is caused by an infection in the tooth’s inner tissue, our board certified endodontist can relieve your pain with root canal therapy. Root canal therapy takes place when a tooth is likely or certain to get infection, due to decay, cracking or other problems. 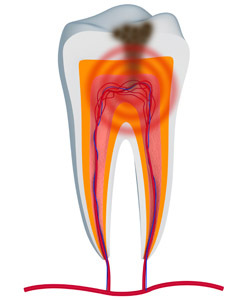 Inflammation and/or infection are often present when root canal therapy is required, and these usually cause the toothaches that send a patient to the dentist. When root canals take place the procedure is simply a case of opening the pulp chamber, removing the infected area and taking the nerve out of the root canals. Once this is completed an inert material is used to fill the root canals and the chamber. Although not always required, our office recommends a dental crown be fitted over the tooth after root canals as this will increase the tooth’s prognosis by six times and prevent any further need for treatments. At The Reno Dentist, we are fortunate to have a board certified endodontist on staff who can perform even molar root canals. An endodontist is a dental specialist who studied the inner tissue of teeth (called pulp) for an additional 2 years after dental school. Patients in the Reno – Spanish Springs – Sparks NV metro area can continue to count on The Reno Dentist to provide even advanced dental care all at the same practice. As with fillings or other treatments, root canal therapy is a nearly painless procedure thanks to the use of local anesthetics and painkillers afterwards. At The Reno Dentist, our staff understands that dentist visits are usually not someone’s favorite thing to do, but we take pride in taking care of you. If you are suffering from toothaches that necessitate a root canal then remember, those toothaches are often much more uncomfortable than the therapy itself. After a short visit at The Reno Dentist you will be back on your feet with a comfortable mouth in no time at all, leaving you pain-free and with a happy and confident smile.